The TTC is venturing boldly into the 1990s. Starting January 1, customers will be able to use their debit and credit cards to purchase fares at all subway stations. “In a global city like Toronto, the idea that most transactions would have to take place with cash is something that is almost prehistoric,” said Mayor John Tory during a press conference announcing the new policy at Victoria Park Station on Tuesday morning. The mayor was joined by TTC CEO Andy Byford, chair Josh Colle (Ward 15, Eglinton-Lawrence), and local councillor Michelle Berardinetti (Ward 35, Scarborough Southwest). The threshold for debit and credit use will be set at $10. Customers wishing to make smaller transactions will still have to use cash. Byford said the measure will ensure that lineups at collector booths are not substantially slowed down by customers punching in their PINs. According to Colle, the TTC is also working on a “wave-and-pay” system for transactions of less than $10, to be implemented in summer 2015. 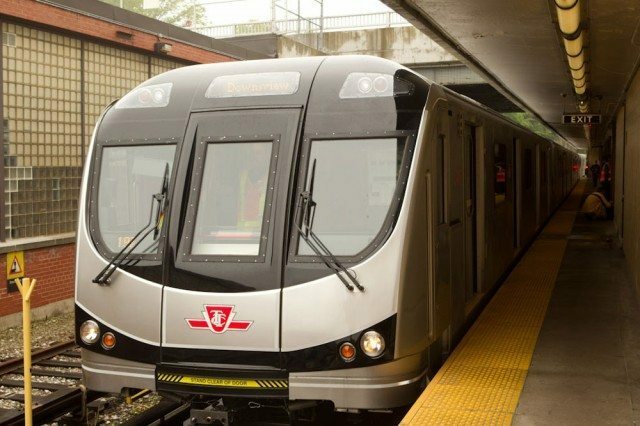 These new measures are part of the TTC’s modernization efforts, and are precursors to Presto implementation, which will likely be completed by 2017 at the earliest. Currently, subway stations accept payment by debit and credit only for Metropasses.